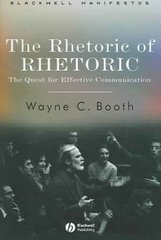 The Rhetoric of RHETORIC 1 Edition In this manifesto, distinguished critic Wayne Booth claims that communication in every corner of life can be improved if we study rhetoric closely. Written by Wayne Booth, author of the seminal book, The Rhetoric of Fiction (1961). Explores the consequences of bad rhetoric in education, in politics, and in the media. Investigates the possibility of reducing harmful conflict by practising a rhetoric that depends on deep listening by both sides.